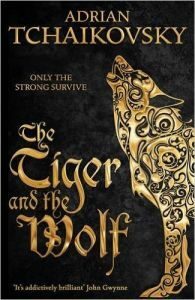 ‘The Tiger And The Wolf’ is the first book in Adrian Tchaikovsky’s new series, ‘Echoes Of The Fall’. Having thoroughly enjoyed his last series, ‘Shadows Of The Apt’, I was looking forward to seeing how Tchaikovsky tackled a new world and new characters. Add to that one of the most stunning hardback covers, designed by Neil Lang, I’ve seen in a long time. Seriously, go and have a look at the beautiful gold embossed design on the textured black background, and check out the detail on the spine and it was impossible to resist! The plot of this book is quite hard to summarise as it’s largely a character-driven story rather than having a definite storyline with a beginning, middle and end. These two characters play nicely off each other, one young and naïve, desperate to find her place in the world, the other old and wise, with decades of knowledge and a patience that seems boundless. Hesprec also has an air of mystery about him and it’s quite interesting to follow him through the story and try to figure out what he’s really doing there. There are a number of other plot strands that follow various other characters, primarily her father, Akrit Stone River, and the two travellers from the south, Asmander and Venater. The characters are all wonderfully portrayed. From the aggressive hatred of Akrit to the calm purposefulness of Asmander and then to the frustrated helplessness of Maniye, they’re all perfectly distinct. The story largely jumps between these three viewpoints, so having such clear individuals really helps to carry the story along and there’s never any confusion about which character you’re currently with. Once again, I’m really impressed with Tchaikovsky’s world-building. He doesn’t seem to do anything in a half-hearted way and, as with ‘The Shadows Of The Apt’, this is a very full world with history, geography, politics and religion all completely integrated into the story without any tiresome expositions. It really is very well done and opens up so many possibilities for future stories in this world that I can’t even begin to guess where he’ll take us next. I look forward to finding out.